Need a side dish for tonight’s dinner? Adapted from The Mayo Clinic, this broccoli cheddar bake recipe will help to satisfy your dairy and vegetable requirements for the day. Broccoli is a great non-dairy source of calcium, which supports strong bones and teeth and helps to support muscle and nerve function, according to the Centers for Disease Control & Prevention. 1. Preheat the oven to 350 degrees F. Lightly coat a baking dish with cooking spray. 2. In a nonstick skillet, combine the broccoli, onion and water. Sauté over medium-high heat until the vegetables are tender, about 5 to 8 minutes. Keep adding water to prevent the vegetables from drying out, but use as little water as possible. Drain and set aside when the broccoli is done. 3. In a bowl, combine the egg substitute, milk and 3/4 cup cheese. Add in the broccoli mixture and pepper. Stir to mix well. 4. Transfer the mixture into the prepared baking dish. Set the baking dish into a large pan filled with about 1” of water. Bake uncovered until a knife inserted in the center comes out clean, about 45 minutes. 5. Remove from the oven and top with the remaining 1/4 cup shredded cheese. Let stand about 10 minutes before serving. Did you try this recipe? 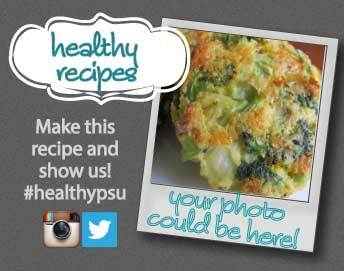 Upload a picture of your creation onto Instagram or Twitter with the hashtag #HealthyPSU for a chance to be the featured image for the recipe. Comment below with cooking tips for this dish!